The Conservancy has partnered with the “Snow Leopard team” of Nepal’s Global Primate Network (GPN) and the Annapurna Conservation Area Project (ACAP). GPN is dedicated to safeguarding the future of wildlife through scientific research and community outreach. Programs aimed at helping herders live with snow leopards are under way or under development in Humla and adjacent areas of Northwest Nepal, and include alleviating people-wildlife conflict, training of citizen scientists, livelihood enhancement, and educational outreach. I have been involved in the profession of yak herding since my childhood. My family’s livelihood depends on the income that comes from selling my yaks. In the past, snow leopards killed the yaks mostly at night, so we let them go freely on the pasture during the day, but recently, because of the increasing number of snow leopards in Manang, they kill the yaks also in the daytime, so we guard the young or newborn yak babies during the day and tie them at the coral at nighttime. Still, we were very worried about the yak calves as snow leopards had killed at least eight newborn or very young ones. 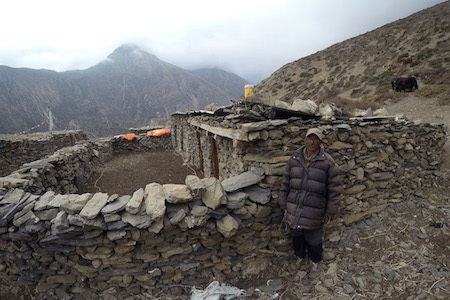 We had seventy yaks before the Snow Leopard Conservancy’s field officer, Mr. B. Gurung, working with SLC, ACAP and National Trust for Nature Conservation, installed the battery powered Foxlight at the side of our goth (corral) in May, 2014. Besides Foxlight, we also use dogs, shouting methods to deter snow leopard during the day, and yak dung fire at night. The Foxlight is very effective, and our herd increased over the two years. But at the pastures, which are very far from the corral and Foxlight, our team has lost 20 baby yaks, killed during the daytime. 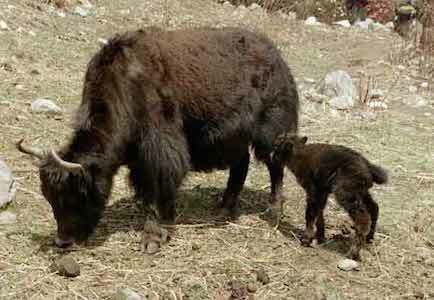 Last winter was cold and harsh and we lost 120 yaks to the cold and to dangerous avalanches. We were very happy with the Foxlight and want to thank B. Gurung and SLC from the bottom of our heart. Rinzin Phunjok Lama, Program Coordinator & Director of High Altitude Mammals Research & Conservation at GPN, observes that snow leopards are often blamed for depredation by wolves or jackals, and that a big challenge is mitigating conflict and developing the support and cooperation of herders. Since Foxlights only work at night, the team is working to strengthen traditional guarding and animal husbandry practices. ← RODNEY FINALIST FOR 2016 INDIANAPOLIS PRIZE!